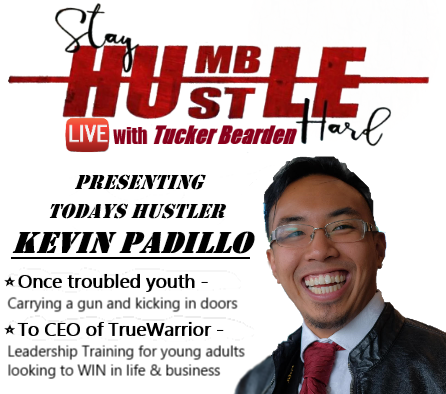 Episode 9: Stay Humble Hustle Hard LIVE with your host Tucker Bearden Tomorrow 10.a.m CSTOur Hustler Of The Day is Kevin Padillo😎 He is a true Warrior who builds Young Leaders!The Founder of Kevin Padillo - Warrior LeadershipKevin's team holds Leadership Trainings that help young people 16-24 build a winning team, double their productivity and triple their CONFIDENCE.Once a former gang member who carried guns. Kevin is now on a path to greatness.I am blessed and honored to call him not only an inspiration to my self and others but THE NEXT GUEST on Stay Humble Hustle Hard LIVE!!! He is a true Warrior who builds Young Leaders! Kevin’s team holds Leadership Training that helps young people 16-24 build a winning team, double their productivity and triple their CONFIDENCE. Once a former gang member who carried guns. Kevin is now on a path to greatness. Stay Humble Hustle Hard LIVE!!! Bro you are awesome!! Thank you for being a guest on the show.